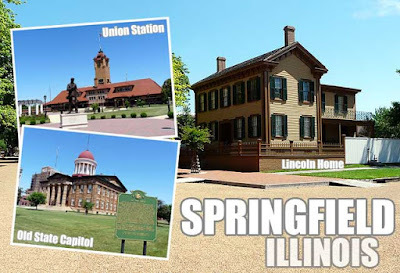 Springfield, Illinois is the hometown of President Abraham Lincoln. 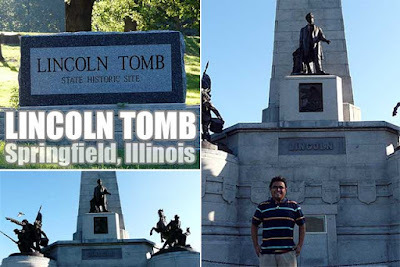 All over this state capital are images, symbols and historical landmarks that remind us of Lincoln, his life and his times. I found out that the Lincoln Tomb was in the Oak Ridge Cemetery in front of our hotel. So I made sure to wake up early to visit before we left for our tour of Springfield. The burial room was closed when I got there since it opened later in the morning. 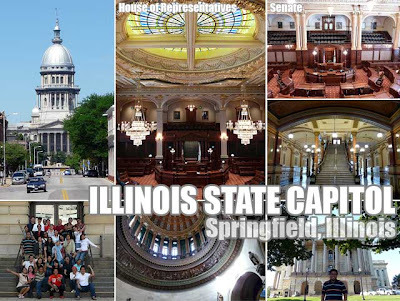 After breakfast at the hotel, we proceeded to the grand and elegant Illinois State Capitol for a guided tour. The Illinois State Congress was in recess so there was not much activity when we got there. We got to see the assembly halls of both the Senate (where Barack Obama once sat as a state senator) and the House. We were also shown the governor's office as well as the hall which used to house the Illinois Supreme Court before it transferred to another building next door. 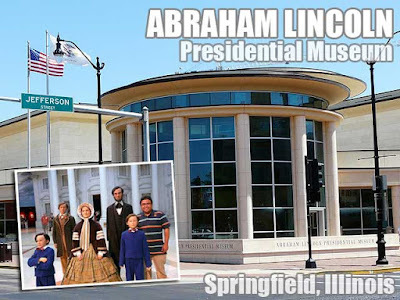 Our next stop was the Lincoln Presidential Museum and Library where we got to enjoy the interactive exhibits, film showings and presentations on Lincoln. In the main hall are life-size wax figures of President Lincoln and his family as they were about to move to Washington, D.C. Don't miss the "Ghosts of the Library" and "The Union Theater" presentations. We had a lot of time to go around the museum so I decided to sneak out and explore Springfield. On top of my list of things to see was the Lincoln Home which was five blocks from the museum. The neighborhood around the home of the Lincoln Family was preserved and recreated giving you a feel of how life was during Lincoln's time. From the home, I walked back to the museum. But I made sure to pass by the Lincoln Law Office which is right beside the Old State Capitol. It was the seat of government from 1839 to 1876 where Lincoln, Stephen A. Douglas and Ulysses S. Grant used to work. Right in front of the museum is the Union Station but it is no longer in use since the railroad tracks have been transferred elsewhere.